The QX3440-D is a fully modular multiservice multiplexer ,with 9 slots of 4E1/T1 2Mbps/1.5Mbps, or n 64/56kbps for network or tributary use. This DACS has a 72Mbps cross-connect capability and supports a wide variety of interfaces: E1/T1 copper or fiber, serial, analog, POTS voice, dry contact, or Ethernet bridge/router . The QX3440-D replaces the discontinued Model IX4200-9, supporting all applications of this older model. All tributary cards from the IX4200-9 can be used in the QX3440-D with a free software upgrade, and conversely, all cards from the QX3440 (with references QX34DD) can be used in the IX4200-9. The QX3440-D is intended to be used in tight spaces, utilizing a compact 2U 300mm deep chassis, with the same capability as the larger QX3440 5U chassis. Both chassis utilize the same CPU. 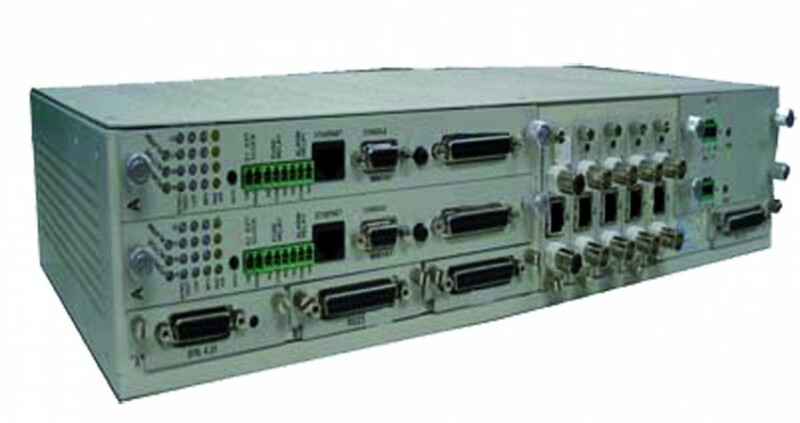 The QX3440-D can be utilized as a E1/T1 TM multiplexer, or E1/T1 ADM in either a bus or ring infrastructure, (with optional UPSR-PDH ring). This supports full 1+1 protection of the E1/T1 circuits, and allows for full redundancy of the CPU, the cross-connect and the power supply. The QX 3440-D supports all modes of standard voice (POTS) interfaces: FXO to FXS, FXS to FXS (PLAR mode), FXS to E1-CAS or T1-CAS and E&M to E&M or E&M to E1-CAS/T1-CAS. For dual telecom environments the QX3440-D supports full E1 to T1 conversion with 64kbps to 56kbps per TS, and A law to µ law. It can be configured as a 30 FXS/FXO POTS channel bank from E1 or T1 CAS, in either copper or fiber. The QX3440-D is manageable in-band over a TS, or out-of-band through the RS-232 console port. It can also be network managed through SNMP in Telnet/SSH, or from a centralized server GUI with CXRView/Plus based on SNMPc, or from CXR-INMS, (an Intelligent INMS for large networks).